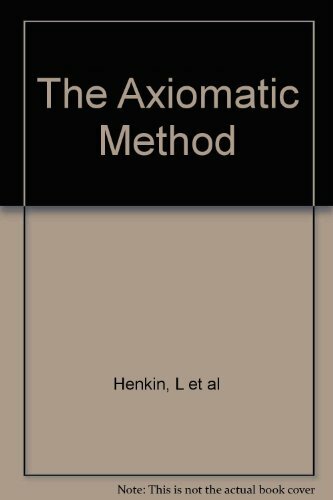 The thirty-three papers in this volume constitute the proceedings of an international symposium on The axiomatic method, with special reference to geometry and physics. The volume naturally divides into three parts. Part I consists of fourteen papers on the foundations of geometry, Part II of fourteen papers on the foundations of physics, and Part III of five papers on general problems and applications of the axiomatic method. This volume includes papers ranging from applications in topology and geometry to the algebraic theory of quadratic forms. Various aspects of the use of quadratic forms in algebra, analysis, topology, geometry, and number theory are addressed. This volume includes articles exploring geometric arrangements, polytopes, packing, covering, discrete convexity, geometric algorithms and their complexity, and the combinatorial complexity of geometric objects, particularly in low dimension. This course is a study of modern geometry as a logical system based upon postulates and undefined terms. Projective geometry, theorems of Desargues and Pappus, transformation theory, affine geometry, Euclidean, non-Euclidean geometries, topology. Contents: Foundations; Linear groups; Isometries of Rn; Isometries of the line; Isometries of the plane; Isometries in 3 dimensions; Symmetry groups in the plane; Platonic solids; Finite symmetry groups of R3; Full finite symmetry groups in R3; etc.